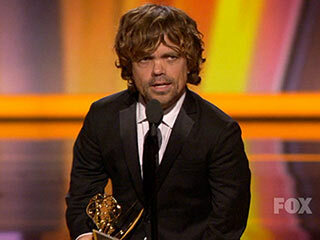 Peter Dinklage won the Emmy Award last night for his role in HBO's Game of Thrones. Way back when I first heard that George R. R. Martin was in talks with HBO to make an adaptation of his fantasy series, I immediately wondered who would play Tyrion Lannister. The character is a dwarf, but the actor needed the charisma necessary to get audience's on his side. What diminutive actor could pull off such a pivotal role? After Warwick Davis, there aren't that many to choose from. Thankfully, the only actor I considered ended up getting the role, and Peter Dinklage's performance in the first season of HBO's adaptation was just as amazing as I had anticipated. It seems that I wasn't alone in my estimation of his portrayal because, last night, Emmy voters honored him with the award for Best Supporting Actor in a Drama Series. When his name was called, the actor slowly made his way to the acceptance microphone (which was significantly lowered for him) and Dinklage was both humble and snarky. "Wow, I followed Martin Scorsese," he said, referring to the director who had just won an Emmy for directing the pilot of Boardwalk Empire. "You're a legend!" He went on to thank his dogsitter, eliciting giggles from the crowd and his wife Erica Schmidt who is much taller than him, before shouting out the producers of Game of Thrones. "I couldn't do this without David Benioff and Dan Weiss, the producers, they were the first to call me and tell me about this part," he said. "HBO you're quite simply the best place to work for you - you let artists create." The win for Dinklage feels a bit more personal to me because I once worked with Peter Dinklage when I was a stage manager in New York. He was developing a show directed by dance legend Martha Clarke about the French artist Toulouse Lautrec. Dinklage played the eponymous role, and fresh off his success in The Station Agent, he was alternately warm and wary of the people around him. Still, the charming smile was always there, especially when he had to deal with Clarke's rambunctious Pomerian dogs. I am happy that Dinklage has gone on to receive credit for his incredible ability, especially in a role that means so much to me and my fellow dorks. With Game of Thrones renewed for at least one more season, I look forward to more Tyrion Lannister and can't wait to see him portray the events of the next few books.